A Frame - The A Frame connects the Sector to the vehicle mount (EZ Classic) with Hinge Pins or to the Lift Frame (MDII and EZ Plus). Aggressor - The Aggressor X moldboard first debuted in 2002. It had a sharper cutting edge angle, and a steeper curve than other plows Meyer made pic1 pic2. It has been replaced by the Road Pro, and it is most commonly seen on Xpress Plows. The Lot Pro moldboard has many design similarities to it as well. Back Plow - Meyer used to make a plow that attached to the rear of the vehicle, which allowed the driver to pull snow out of areas instead of having to push it. Here is a brochure for it. Backdrag Edge - I personally DO NOT recommend a back dragging edge for ANY Meyer plow. There is no edge tripping mechanism to protect the plow when it hits an obstruction like there is when pushing snow forward as the plow was designed to do. Using a back drag edge can quickly lead to severe damage to your Meyer plow. Mounting a back drag edge will void your new plow warranty too, and rightfully so! The proper tool to peel up hard pack and ice is deicing materials. USE THEM. Belt Driven - This describes an engine mounted hydraulic pump that was popular in the 1970's and prior years. 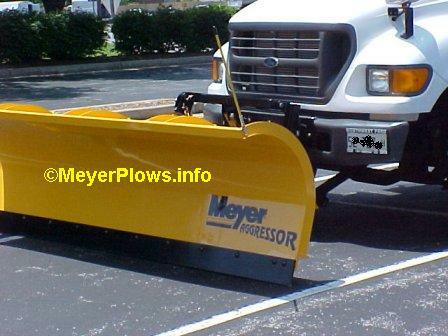 C Series- The Meyer Commercial line of plows. In 1969 it was called the "Husky" Line. It was available in 7.5' - 9' widths. The C Series was discontinued in 2009. C Valve - The C Valve on a Meyer plow pump controls the Right Angle function. It is a common failure part for a number of reasons, some can be avoided, and some are accidental. It boils down to NOT plowing at excessive speed. CLF - This refers to the Clevis Lift Frame carton. Since the Clevis and Lift Frame are universal, and must match, they are sold together in a carton. Complete Plow - This may seem odd, but a complete plow is made up of 7 pieces. The Moldboard, SAF or PAF, the CLF, the Hydraulic Carton, the Light Carton, and the vehicle Headlight Adapters. These 7 cartons are shipped to Distributors, who assemble and sell them to you, or sell them to Dealers who have to assemble them. Crankstand- Very similar to a trailer tongue jack, this allows the plow assembly to be aligned with the vehicle ride height (which can easily change based on contents of the vehicle, passengers, frost heaves, etc) to make driving into the plow assembly for hookup easier. It is standard on EZ Plus and MDII plows. Crossover Valve - The Crossover Relief Valve in mounted in the Side of the PA Block on the E-47, E-57, and E-60 units under the large acorn nut. It opens when an immovable object is struck with the plow, and allows hydraulic fluid to flow from the PA Ram that is being compressed by the force of the hit, to the other PA Ram that is being pulled out (extended) by the hit. The fluid can only get through the small orifices so fast, and if the hit is hard and fast, the hydraulic fluid spikes up into the C Valve, resulting in a damaged (swollen) C Valve. If the unit has not been serviced regularly, the Crossover Valve can dry out inside, and it is common for the heavy spring inside the Crossover Valve to rust, often a hard hit will shatter the spring. Even well lubricated springs can shatter if the hit is hard and fast enough. Custom Classic - The Custom Classic refers to mounts made prior to 1991 when the EZ Mount came out. The mounts were all Custom made to fit each individual vehicle, which was a tough task as truck bumpers became more aerodynamic and fancy. The Custom Classic usually included new bumper brackets for the truck, because the permanently mounted Lift Frame was mounted behind the vehicle front bumper. The EZ Mount had the removable tubular Lift Frame that attached under the bumper, which eliminated the need to design individual Lift Frames for each vehicle. The EZ Classic became standard, and the Custom Classic phased out. Meyer is no longer manufacturing ANY Custom Classic mounts. What is out there is it! Cutting Edge - This is the actual blade that makes contact with the ground when plowing, It is a wear item that needs to be replaced when worn down, PRIOR to wearing into the actual Moldboard. Diamond Edge - This is what used to be Diamond Plows. Now they are known as "Meyer Diamond Edge". Which is a Meyer plow with a trip edge. VERY popular in the Northeastern US. Drive Pro - The Drive Pro replaced the TM and ST Series. Sizes range from 5 - 7.5' wide. E-45 - The E-45 was a converted U-13 with Solenoid Valves on it. E-46 - Was a raise and lower unit only. It sis not have power angle. It was identical to an E-47, it just didn't have a PA Block on it. A PA Block will bolt right on, making it an E-47. Additional wiring is required in that case. E-46H- The High Lift version. It was 2" taller, and had a stroke 2" longer than the standard E-46. E-47- The E-47 first debuted in 1975. It was called Electro-Touch. It featured Toggle Switches to control it. This was the first completely electric unit Meyer made, no more choke cables. It was discontinued in 2005, or thereabouts, which was a 30 year run! E-47H- The High Lift version. It was 2" taller, and had a stroke 2" longer than the standard E-47. E-48- This is a rare pump and I cannot find any literature on it. It featured 4 valves on the PA Block and I am told it was used to apply downpressure to the Moldboard via a double acting cylinder from the truck frame to the A frame, and it could also have used the two extra valves to run a back plow. There was one on eBay a while back, and the owner had used the extra two valves to run a dump body supposedly. If you own one give us a call, we want it! E-57- First came out in 2001. There was also an update kit for E-47 units that was a Gear Pump and Motor, to upgrade them to E-57 units. By changing the PA Block again to the latest revision, an E-57 can be converted to an E-58. E-57H- The High Lift version. It was 2" taller, and had a stroke 2" longer than the standard E-57. E-58H- The High Lift version. There is no standard lift version of the E-58. E-60- This was a totally new design in 1991. It is the "Quik Lift". It was the first time since the T Series Pumps that the motor was mounted horizontally. It was the fastest unit Meyer had made to date. The pump itself had a higher GPM flow than previous units, and the standard E-60 pump put out 2500PSI. It was set at 2500 PSI due to the small diameter of the lift piston on the end of the lift ram. The small surface area required 2500 PSI to lift the larger blades. The pump itself is capable of over 5000 PSI but the top cap of the unit will blow into pieces at approximately 3000 PSI. This is why it is VERY important to have the pump pressure set properly, with a pressure gauge. Also available as an E-60H model. The H stands for High Lift, it has a 2" longer stroke versus a standard model E-60. The E-60H utilized the same larger diameter lift piston as the E-47, so pressure was only set at 2000 PSI, which was capable of lifting the larger blades. It also meant less amp draw on the vehicle electrical system with the lower pressure setting. It also featured an adjustable drop speed for the first time. It was discontinued by Meyer Products a couple of years ago. Meyer will offer parts for about 10 years, I am sure the aftermarket will offer them for many more than that. The E-60 is a favorite with many Meyer owners because of its speed. The new E-58H that replaced it in the Meyer line up is just as fast, or even faster, and it too has adjustable drop speed. E-60H- The High Lift version. It was 2" taller, and had a stroke 2" longer than the standard E-60. E-61H- The High Lift version. It was 2" taller, and had a stroke 2" longer than the standard E-61. E-68 - The E-68 is the standard hydraulic unit used only on Meyer Xpress plows. E-78 - The E-78 was a very short lived unit. It was an attempt by Meyer to go to wireless controllers, and the E-78 featured the same type of electronic "brain" mounted under the pump cover as the E-88. E-78H- The High Lift version. It was 2" taller, and had a stroke 2" longer than the standard E-78. E-88 - The E-88 was the standard hydraulic unit used on the Meyer Xpress plow. It featured a wireless controller. It featured a wireless controller in that there were no wires running from the controller out to the hydraulic unit up front. The Motor Solenoid and an electronic "brain" were mounted under the pump cover. It was upgraded to the E-68. Electric over Hydraulic - This simply refers to a pump being driven by an electric motor versus a PTO shaft off the vehicle transmission, or a belt driven engine mounted pump. EZ Classic - The EZ Classic mounting system replaced the Custom Classic mounts, it debuted in 1991, and featured a removable lift frame. When it first came out it was called the EZ Mount. When the EZ Mount Plus came out, it changed to EZ Classic. Headlight Adapter - Required to switch from vehicle headlights to Nite Saber plow headlights. The Headlight Adapter connects to the vehicle headlights, and to the Headlight Modules. The part# required is based on the vehicle headlight bulb. Headlight Module- Required to switch from vehicle headlights to Nite Saber plow headlights. There are 3 variations of Headlight Modules to date. The newest gets power directly from the battery, and has replaceable fuses in it. Earlier versions were sealed. There are two required, one for each headlight. Hinge Pin - These are the bent pins that attach the plow blade to the vehicle on Custom Classic, and EZ Classic plows. Home Plow - This was released in July 2010, and it is called the "Home Plow By Meyer". Meyer builds them, but it is NOT part of the Meyer snow plow line in that it is sold at places other than Meyer Distributors and Dealers. It is NOT covered by the ROC Solid Warranty, it only has a 1 year warranty. It is made to mount into an existing Class 3 front receiver hitch on a vehicle. Husky - The Husky line of plows debuted in 1969 in response to the needs of commercial snowplowers. It became known as the C Series (the C stands for Commercial). The C Series ran from 1969 until it was discontinued by Meyer in November 2009, which was a 40 year span! Hydra-Flush - A flushing fluid Meyer recommends for cleaning out the plow hydraulic system. Also known as M2. Hydraulic Carton - The box that contains the Hydraulic Unit (E-58H, V-70, etc) and it includes the PA Rams, hoses, Universal vehicle wiring harness, and standard plow controller. King Bolt - The center pivot bolt that the plow pivots on when the blade is angled from one side to the other. Lift Arm - The arm that protrudes from the front of the Lift Frame that the chain or chains connect to, that raise and lower the plow. Lift Cylinder- This has two meanings. Initially it referred to an assembly, in basic terms, a single acting hydraulic cylinder that was used to raise and lower a plow. It is also the cylinder that is mounted inside the hydraulic unit, that the Lift Ram rides up and down in via the Piston that is on the end of the Lift Ram. Lift Frame - The Lift Frame is what the hydraulic unit and plow lights attach to. With the EZ Plus and MDII mounts, the A Frame is connected to the Lift Frame with 1" diameter pins. Lift Ram- This has two meanings. On older units it referred to a single acting hydraulic cylinder that was used to raise and lower a plow. It is also the chrome rod that you see on all Meyer hydraulic units, that raises and lowers the plow. Lot Pro - This is the Meyer commercial line of plows that officially replaced the C Series in November 2009. M-1 Fluid - This is what Genuine Meyer Hydraulic Fluid is called. It has not been blue for many years now (it is yellowish/clear), so the old term "Meyer blue fluid" no longer applies. IF your fluid is blue, it is not M-1 fluid, or it is old stock. Using anything other than M-1 fluid in your hydraulic unit will void your warranty. Additionally, your hydraulic fluid must be changed at least once a year to keep your warranty in effect. If you change it yourself, or have it changed at a shop, SAVE YOUR RECEIPT as proof of having it changed. Additionally, it contains anti-icer that will allow moisture to mix with the oil, but it can only absorb so much before the moisture separates, and in addition to the moisture causing internal parts to rust, it can freeze and cause severe damage to the pump. SO CHANGE YOUR FLUID! MDII - The MDII stands for Meyer / Diamond II. It debuted in 2000. Meyer Products bought Diamond in 1991. Where Meyer offered the EZ Mount, Diamond offered the Pull-Away mount. They both used the standard Lift Frame design with one difference; the Diamond used the H Model pumps with a different Lift Arm to accommodate the dual lift chains versus Meyer using the Standard Model pumps, standard Lift Arm, and single Lift Chain. The MDII allowed one mounting system to be manufactured, and the H Model pump to be used. The MDII allowed just the blade to be removed (disengage one yellow handle pin on each side), or the entire assembly to be removed from the vehicle (disengage two blue handle pins on each side). It also featured a crankstand for the first time, to make hooking it up to the truck easier by allowing the driver to adjust the height of the plow to match the vehicle height. Back in 2000, Meyer was the only plow manufacturer to offer the option of dropping just the plow blade off the vehicle or the whole plow assembly. The MDII evolved into the EZ Mount Plus. Module - See Headlight Module. Mounting Carton - This is the "mount" you need to mount a Meyer plow on your vehicle depending on what mounting system you have or need, contents vary. Nite Saber - Meyer Nite Saber lights were the replacement for the the Truck Lites. As vehicle electrical systems became more advanced, it became necessary to isolate the plow lights from the vehicle electrical system. Cutting into the vehicle headlight harness was the old way with the Truck Lites. The Nite Sabers feature change over modules that plug into the existing headlight harness using adapters. Nite Sabers have a single high beam/low beam halogen bulb. The latest revision includes replaceable fuses, and earlier versions were "potted" in epoxy, and when a fuse blew, the module had to be replaced. Nite Saber 2 - A MUCH nicer light than the Nite Saber. It has a fog light style base mount to make adjustment easy, and it features stainless steel hardware to ensure adjustments will always be easy. They have separate bulbs for high and low beams. Old Man Winter - He replaced Pete the Penguin as the Meyer Mascot in the 1970's. PA Block- Power Angle Block. It houses the Solenoid Valves for Power Angle (and depending on the model, raise and lower too). PAF - Pivot Bar A Frame, typically referring to the PAF Carton, which contains the Pivot Bar, and the A Frame. Pete The Penguin - He was the Meyer Mascot in the 1960's. He was replaced by Old Man Winter in the 1970's. Pistol Grip Controller - This is the new standard controller for all new Meyer plows. It is a hand held unit. Pivot Bar - The Drive Pro, Lot Pro, and Xpress plows all have Pivot Bars unlike the ST and C Series that had Sectors. Pivot Pin - This is the pin that connects the Moldboard to the Sector on ST and C Series plows. There is one on each end of the Sector. There is a Pivot Sleeve on the Sector, and one on the Moldboard that with the Pivot Pin make a "hinge" that allows the Moldboard to pivot forward and trip when an obstruction is hit while plowing. It is VERY IMPORTANT to keep these pins greased! Meyer has Pivot Pins with grease fittings on them to make it easier to keep them greased. Pivot Tube - There is a Pivot Tube welded onto each end of the Sector on ST and C Series plows. There is a Pivot Tube welded into two ribs on ST and C Series plows. The Pivot Pin connects these two sleeves forming a hinge for the plow to be able to trip forward when an obstruction is hit while plowing. Pivot Sleeve - See Pivot Tube. Poly - Meyer fist introduced High Molecular Weight Polyethylene moldboards in 1988. They were the first plow manufacturer to do so. 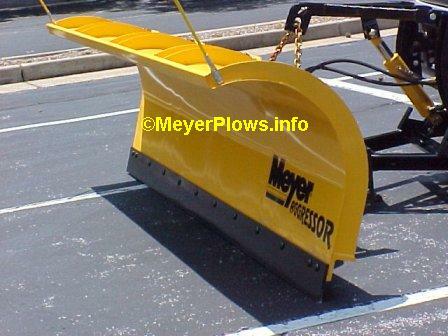 It was called the Meyer Max, and it featured a standard snow deflector, and a 2 year warranty versus the steel plows. Contrary to popular belief, the poly plows are anywhere from around 50 - 70 pounds heavier than their steel counterparts! Definitely MAX when it comes to construction and strength. The Lot Pro series offers poly versions as well. Pull-Away - This was the diamond version of the EZ Classic. It utilized a very similar Lift Frame like the EZ Classic, but the way the blade attached was completely different. There were graduated "step" so the plow could be attached to the vehicle at various heights. Road Pro - The Road Pro replaced the HM Series of plows in November 2009. ROC -Reliable Over time Construction, also the ROC Solid Warranty. Meyer warranties their plows (and some spreaders) for 3 years from the purchase date, covering EVERYTHING other than abuse, wear parts, light bulbs, and the plow guides, they go even further and warranty all welds and structural members for 5 YEARS! Visit the www.MeyerProducts.com web site for details. Runners - Runners are adjustable cast iron/steel blocks that allow the plow blade to ride a set distance off the pavement or ground when plowing. They extend the life of the Cutting Edge by carrying the weight of the blade. Runners can be replaced as they wear. There is no need to replace the Spindle unless it is damaged from excessive Runner wear. SAF - This is an acronym for the Sector and A Frame. Sector - Connects the Moldboard to the A Frame, allowing the Moldboard to Pivot on the King Bolt left, and right. The Trip Springs and PA Rams attach to it as well. Signal Stat - This is the brand of the LARGE plow lights Meyer used in the 1970's and 80's. They were replaced by the smaller streamlined Truck Lites. Slik Stik - First debuted in the late 1980's, it is commonly referred to as the joystick controller, or single lever control. Solenoid Valve - Consists of an electromagnetic Coil, and Valve. Spindles - The Runners are replaceable. The mount on Spindles, which slip into brackets on the back of the Moldboard. ST Series - This stands for STandard Series, it is the Standard line of plows Meyer made. It was replaced in November 2009 by the Drive Pro 7'6". T-6 - From 1940 - 1960, the T Series pump was named Electro Lift. The T-6 was the last of the T Series that started in 1938 with the T-1. TM Series - This is the Two Meter series of plows, which is odd because they were available in sizes from 5' to 6.5' wide. The TM Series took the place of the ST-78, which was a 6.5' plow that was too heavy for new light utility vehicles at the time. Toggles - This simply refers to the two toggle switch control used on the E46 (single toggle) and the E-47 ("two toggles" or "twin toggles"). Touchpad - The first Meyer Touchpad Controller was called the Electro Touch Control, it debuted in 1992. It was an analog design. In 2000 it was replaced by the Electro-Touch Digital Control touchpad that is still made today in 2010. The Touchpad was the standard control for the E-60 from 1992 until the E-60 was discontinued around 2008. Truck Lite - Supplied most of the plow lights to Meyer in the 1980's and 90's. U-13 - When the automobile industry switched from 6 volt electrical systems to 12 volt systems, Meyer introduced the "Super Electro-Lift". It was an electric over hydraulic design, featuring an "efficient gear type pump", and it used choke cable to operate the motor and open and close mechanical valves at the same time, to give the desired result (up/down, and eventually left/right). In 1969 Meyer introduced Power Angling, and the U-13 was the pump that first had it. Note: I cannot verify this 100%, there may have been earlier versions of the U prior to the 13 that were up and down only. The U-13 had Power Angle in 1969. It was replaced by the E-45, which was a U-13 with a PA Block on it with Solenoid Valves. Universal Clevis - This is the center section of the vehicle mount that is visible (when the plow is removed) on all MDII, EZ Plus, and Drive Pro mountings. It is universal, only the brackets to attach it are included in Mounting Cartons for the EZ Plus and Drive Pro mountings. Xpress - The Xpress Plow debuted in 2004. It was the first pickup sized Aggressor X Moldboard. It has been replaced by the Lot Pro.